The USTA Foundation announced today that it has surpassed $40 million in total giving to tennis and education programs and under-resourced youth since its inception, with over $40.2 million distributed. In 2018, the USTA Foundation awarded more than $6.6 million in support of its key programs and initiatives under its structure. 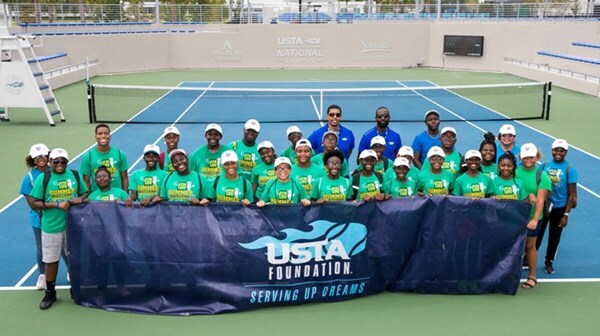 These include National Junior Tennis and Learning (NJTL) Excellence Teams, STEM and ACE curriculums, technical assistance, programming and capacity-building grants, and college scholarships. Of that, more than $4.7 million was awarded in grants and scholarships, and $1.9 million was distributed in support of program services that are vital in helping NJTL chapters remain sustainable and impactful for its youth participants. These services include technical assistance, coaches training, program evaluations and delivery methodologies. In the USTA Foundation’s year-end funding cycle, $1.2 million in capacity-building and program grants were distributed to 43 local NJTL chapters nationwide to help strengthen their programming and capacity-building infrastructure. USTA Foundation’s corporate philanthropic support continued in 2018 with nearly $2 million from multiple partners who supported a variety of the Foundation’s programs. National Partners include American Express, Chase, Deloitte, ESPN, Rolex and Wilson. In achieving this new mark of $40.2 million, the USTA Foundation has now awarded funding to hundreds of community-based, grassroots programs, benefitting thousands of children through tennis, education and health programming, primarily through the NJTL network. This network features nearly 300 chapters that reach approximately 180,000 youth on an annual basis, providing free or low-cost tennis and education programming to the 50 largest markets in the U.S. – nurturing future leaders and enabling kids in need to succeed on the court, in the classroom and in life.